I emailled Kenneth and asked him some questions. So exciting to have a dynamic young coach with his international experience feeding into our high performance programme. 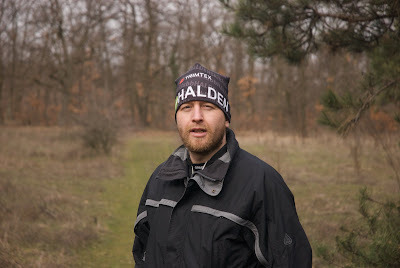 I am looking forward to him refining and focussing the raw talent of Ross and Chris et al at WOC 2009 - Hungary. Good skills to all involved!! Kenneth, can you give us a little bit of background about your previous experience in orienteering. Were you an elite yourself or has coaching always been your interest? [KB] I never performed really good as an athelete, but I tried my best for some years and learned at lot from it. I also started early out as a coach (when I was 20) and when I was 26 I decided to focus a 100% on coaching. I was more succesfull as a coach so it was an easy choice to focus fulltime on coaching. Im now 29 years old and from Denmark but Im living i Halden in Norway. Im a fulltime coach in Halden SK. Ive always been interested in the mental part of a performance so coaching was an easy choice. Do you have any formal qualifications in sport science or coaching? [KB] I have a bachelor degree in sport science with a speciality in coaching and orienteering. What, or who, are, or were, your influences in orienteering coaching, how have you developed, or adapted, ideas to improve orienteering training? Can you sum up your opinion on the skills upon which are sound orienteering technique is based on? [KB] Its hard to say this shortly. I think that this is the best place to start as a runner, but it does not matter how fast you can run if you can't find our way. The techniqe is a bit different form person to person, but to be aware of your flow, how to get there and how to refocus a headpoint to get control at. Hope you understand. Who is technically the best orienteer you have coached? What was most special about him/her? [KB] I work with runners on different levels and it's hard to take credit because my influence is so different. But for sure working with runners like Anders Nordberg, Anne Margrethe Hausken and Emil Wingstedt and other runners that really want to be good is really fun. There is a difference between those who get best and those who don't, It's awesome working with the giants. What gives you job satisfaction? are there particular athletes you have helped really turn the corner and overcome technical, physical or mental problems, what sort of problems were these? [KB] Agian it's so different my job from runner to runner and just being in the process with an athelete that really put his or her best in to it, gives me satisfaction. I keep this kind of list to myself so I hope you accept that. But finding the right state off mind is the thing I work with the most. What do you know about New Zealand elite orienteering? [KB] I dont know so much, but Ross Morrison lives in Denmark and I've talked with him and followed his results the last year. Apart form that I remember especially the New Zealand female juniors did well in JWOC in Australia. So there is some talent for sure. What are your goals in accepting this position to coach the New Zealand WOC team? [KB] I want to help the runners perform their best races at WOC 2009. That is my only goal. What do you see are the areas in which we can improve the performance of New Zealand athletes? [KB] I can't say that yet but I will get back to you on that when I have talked with some more runners. A thing could be the mental perfomance, but we will see. What strategies or "requirements" are you going to suggest to, or ask of, the athletes that are selected? Are these strategies or "requirements" specific to performance in Hungary or more widely applicable? What is going to determine the success of this assignment from your viewpoint, both in terms of performance and your own development as a coach? [KB] To dare to do your best, when it's required. And for sure to enjoy an have fun on the way.